“The most important thing we can be today is human” – says David Amaneddine, SME businessman and CEO of AAA City Removalist at its Transportation and Removalist Workshop 2018. At the gala event, Mr. Amaneddine and his executive team recognized the efforts of all those who have made AAA City Removalist a leading home and business relocation service provider in Sydney today. In total, the company has moved over 140,000 homes and businesses in New South Wales, and interstate – making it one of the largest and most successful operations of its kind, by far, in New South Wales. Among those feted were the company’s staff who included the company’s truck drivers, logistics managers, business managers, call service operators and members of other departments. Also recognised were partners like Clixpert Australia who have provided AAA with marketing services almost since they first started in 2005 and the various business associations and chambers of commerce who have so liberally provided Mr. Amaneddine and his company with support in the area of business, marketing, and commerce. “Understanding calculus is relatively easy compared to understanding human beings, and what drives them” said Mr Amaneddine as he announced new plans by AAA City Removalist to “better understand the psychology of its customers” by commissioning Behavioural Science Experts, Professor Michael Jones, and Dr. Nicholai Popov to assist his company to develop in its understanding in this area. “Customers are the lifeblood of any industry and for SME businesses, the way we treat them makes the difference between whether we thrive or survive”, Mr. Amaneddine commented. 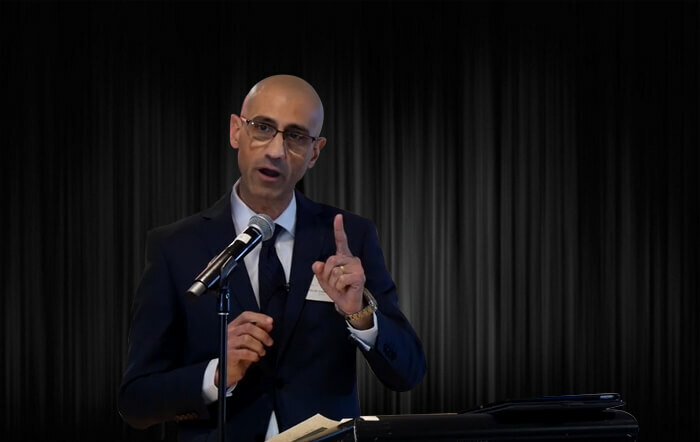 In his speech, Mr Amaneddine also took time to note some of the logistical challenges the transport, logistics and home and commercial removal industry faces which include stiff competition, price undercutting, reviews on social and other media, unfair parking penalties, congestion on roads and the negative effect the slowdown in the housing market has had on business in 2018. Despite the challenges, however, Mr. Amaneddine still found time and wallet to make a generous donation of $2,000 from AAA City Removalist to Professor David Lamond, Chair and Company Secretary of the Michael Hughes Foundation. The Foundation aims to turn bystanders into responders to save lives in case of sudden cardiac arrest. Besides awareness, the Michael Hughes Foundation works with local, state and federal governments to increase the number of automatic external defibrillators (AEDs) in the community; and presenting training and information sessions on CPR and use of automatic external defibrillators or AEDs. “To be human is to have a heart – one that’s on fire”- and that’s how we describe Mr. Amaneddine and his team at AAA City Removalist. They’re on – FIRE! AAA City Removalist is a leading home and commercial removalist company in New South Wales. With 140,000 moves behind them to date, the company moves numerous homes and businesses every year. The preferred partner for the Sydney Opera House, AAA City Removalist values people and takes worker safety very seriously. It is one of the few removalist companies with Workers Compensation and training programmes in place for staff and contractors. A generous donor to several charities including Westmead Hospital, the Salvation Army, Joyce Meyer Ministries, Hope 103.2, the Michael Hughes Foundation and others. AAA City Removalist is now moving to use trained psychologists to better understand its customer’s wholistic needs so it may serve them even better.